On the 5th of September (2017) an article published in The Hindu rekindled debate over a question that has caused controversy in the past, the piece was titled Who were the first settlers of India? This is my response to that article, providing a rather lengthy answer to the question it posed. The author of the report, Tony Joseph, points out that several recent research projects have produced evidence which collectively pushes back the dates for the appearance of modern humans in Australasia and Southeast Asia. India is positioned right in the middle of the purported coastal route for human migration from Africa to Australasia, and as such, it is only reasonable that Indians are left wondering whether they should also be expecting a revision to their own pre-historic history. India can boast a remarkable and lengthy history of hominin occupation, recent discoveries in the Siwalik hills, about 300 kilometres north of New Delhi, have placed early Homo individuals in the country earlier than 2.6 million years ago. The joint Indo-French archaeological team investigating the Siwalik hills site has come under considerable pressure to vigorously defend such an early date. The project’s leaders, Mukesh Singh of the Society for Archaeological and Anthropological Research in India and Anne Dambricourt Malassé of the Institute of Human Palaeontology in Paris, both stand by their findings (Malassé, A, 2016). Rather less controversial than the Siwalik hills research is the discovery of 1.8-million-year-old Acheulian type stone tools usually associated with Homo erectus, uncovered at the Attirampakkam dig site in Tamil Nadu. Stone tools dated between 800,000 to 10,000 years in age are found at various locations around the country. One Homo erectus skull uncovered on the banks of the Narmada River produced a date of 300,000 years in age. It is also possible that India was the land where humans first transferred abstract thinking from within the brain to art on a cave wall. In November of 2017, The Hindu published a news story which claimed rock art at Madhya Pradesh had been accurately dated (after previous failed attempts) to between 300,000 and 500,000 years ago. The team involved was headed by two of the most highly acclaimed rock art experts, Professor Giriraj Kumar and Robert G. Bednarik. This revelation suggests India boasts the oldest rock art on the planet and by a considerable margin! Extinct hominins in India are not the focus of Joseph’s article, the issue that interests most people is the arrival of Homo sapiens to India. The report offers us two date ranges, the more controversial is associated with an early wave of modern humans speculated to have reached the Indian subcontinent between 120,000 to 74,000 years ago. The far more widely accepted version of events, involves modern humans entering India between 60,000 and 50,000 years ago. The more recent dates range fit well with the existing consensus Out of Africa migration theories. I would ask the question here why it is we must choose one or the other of these two options when the archaeological evidence clearly shows modern humans moving around India during both suggested periods. The real conundrum is why do we have proof of two human colonisation events if there was only one migration from Africa? Conquest of Eurasia by a single wave of migrants is confirmed by the findings of multiple genetic studies incorporating DNA from human populations across the globe. There is no doubt that modern Eurasians stem from a migration event beginning around 60,000 to 50,000 years ago, a mound of peer-reviewed papers confirms this as fact. The confusion comes with the fact that there is clear evidence of modern human’s present in Eurasia much earlier than this date. Joseph comes close to solving this puzzle when he briefly refers to the eruption of the Lake Toba supervolcano on Sumatra, an event that has been convincingly dated to 73,600 years ago (Storey et al., 2012). The after-effects of the eruption were nothing short of cataclysmic, with the vast dust cloud bringing about a nuclear winter for the entire northern hemisphere of the planet. We know humans of various kinds were on the Eurasian continent at the time Toba erupted, and we know that when our direct ancestors arrived all that remained was small bands of Neanderthals in Western Europe and the Middle East. 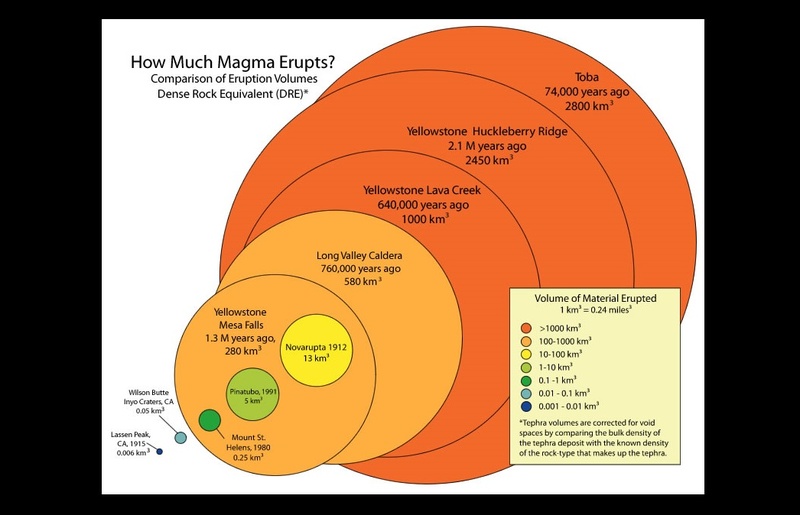 The math here should be simple to calculate, archaeology places a sizeable and diverse human population in Eurasia up until 74,000 years ago, then the most powerful eruption in the last two million years occurs. Following the volcanic eruption, all that remained of the first human population was bones and stone tools. The genes of the first modern humans in Eurasia were not passed on to us only because the carriers were obliterated. This extinction event has typically been overlooked by researchers up until now, hence the continuing confusion among paleoanthropologists and evolutionary biologists. The Hindu article brings up two incredibly important studies completed in the last few months. The first study, involving the dating of artefacts at the Madjedbebe rock shelter in Northern Australia. The team from the University of Queensland has established a minimum date for the occupation of the site at 65,000 years ago, but the scientists involved also stated that there was a 95% chance of the exact dating being earlier than 70,000 years. Several artefacts at Madjedbebe produced dates close to 80,000 years ago. The second revolutionary study referred to concerns the dating of teeth found in the Lida Ajer cave on Sumatra, establishing that modern humans were present in a tropical forest location sometime between 73,000 and 63,000 years ago. The investigating team included scientists from both Macquarie University and the Australian National University using new technologies to date what were in fact quite old finds. The middle point in this age range, 68,000 years, fits very well with the understood time of arrival for the ancestors of modern Eurasians. This middle of the range date also fits well with the hypothesis that modern humans were re-colonising Eurasia as the climate recovered from the effects of the Lake Toba eruption. It should be mentioned here that modern humans living in a jungle location, in the interior of Sumatra, does not fit well with the suggestion that the first Eurasians were coast-hugging people reliant on fishing. These early migrants may have then been well adapted to sustaining themselves with a tropical forest – a skill set that takes considerable time to acquire. Tropical forest environments cover much of Northern Australia and any humans moving from Australia to Sumatra would likely have knowledge of how to survive in a jungle. With archaeological evidence now placing modern humans in northern Australia over 70,000 years ago, this becomes a hyper-relevant detail. Even though the two studies highlighted here undermine the theory that a recent migration out of Africa populated Eurasia sometime between 70,000 and 60,000 years ago, other scientific findings obliterate this model entirely. I would highlight here the recent analysis of a shell midden site at Point Richie, Victoria, carried out by Dr James Bowler, professor of environmental history at the University of Melbourne. Jim Bowler is probably the most respected geochronologist in Australia. “The shells are sitting below a very thick soil, a thick layer of calcrete. That calcrete in Australia takes at least 20,000 to 30,000 years to form. That’s sitting underneath the Tower Hill tuff at 35,000 years. So, we’ve got Tower Hill at 35,000 plus a minimum (for the calcrete) of 25,000 to 30,000 which takes you back to 70,000 for the soil evidence, 80,000 from the shell evidence … so we have come up with an age of 70,000 to 80,000 for the shells with a preference for the 80,000,” said Dr Bowler. As much as early sites in Indonesia and on the northern coast of Australia are problematic, the presence of modern humans on Australia’s most southerly shores 80,000 years ago, can’t fit into the current consensus theory of the continents occupation. Allowing for gradual population expansion across the landmass we would expect it to require over 10,000 years for modern humans to reach Point Richie. Let’s return to India for a moment and highlight some of the last signs of modern humans before the Toba eruption. At the Jwalapuram archaeological site in Andhra Pradesh, scientists uncovered stone tools beneath the Lake Toba ash layer, dating human inhabitants in the region around 77,000 years ago. The Jwalapuram team suspected that modern humans had been present in India at least as far back as 100,000 years ago. Whoever it was that made these stone tools the fact is that they were there 77,000 years ago, and after Lake Toba erupted their population vanished. Modern Eurasians show no sign of DNA associated with any migrations into Eurasia over 77,000 years ago. Genes help to instruct us on the fascinating tale of Eurasian colonisation. Australasian populations are the oldest non-African grouping on the planet, they diverged away from Sub-Saharan Africans around 73,000 years ago, right around the time of the Lake Toba event (not a coincidence as you will soon understand). These earliest non-Africans, sometimes known as Proto-Australoids, carried three distinct mtDNA lineages, haplogroups M, N and R. These three genetic lineages are considered foundational for all Eurasian peoples. Conversely, these three haplogroups were not present in stone-age Africa, understood to have emerged somewhere in the Southeast of Asia. Some readers may well read that last line and wonder why it is scientists believe the colonisation of Eurasia began in Africa. Mapping the expansion of haplogroup L3 into Africa. The answer to the ‘why Africa’ question emerges from deduction of the ancestry of the M, N and R haplogroups. The common ancestor of HgM, HgN, and HgR is understood to be HgL3, the latter is indeed associated with an African origin. At least, that we know HgL3 appeared in Africa quite suddenly around 70,000 years ago, not so much time after the Lake Toba eruption. Little is known on the minutiae of HgL3 origination, neither the cause or the particular location. If we accept that HgL3 emerged first in Africa from an older African lineage, then we must accept that the colonisation of the planet started from there and not earlier than 70,000 years ago. Even with modern humans quite clearly evidenced to be in Australia at least 80,000 years ago and carrying the daughter lineages of L3, we must still somehow cram this square peg conclusion into our round hole evidence. If we could find a population group anywhere on the planet beyond Africa that had been in place longer than 70,000 years and demonstrated that they carried the expected genetic lineages, we would have an incredibly compelling case for HgL3 being a non-African lineage. If we were to establish the Into Africa argument as valid, we might then wish to strengthen our case by seeking out signs of HgL3 having been carried into the continent and investigate the geological and paleoclimatic data for indications of an event that might have pushed such a population into Africa. Rather than repeat here the two possible answers proffered to us in the news piece, neither of which I agree with, I will offer you my own feeble attempt at a logical explanation which fits all of the known evidence and ties up every loose end. It is my suggestion that by 74,000 years ago hominins of various types, including several Homo sapiens subspecies, covered much of Eurasia. These populations were also apparently rather partial to each other, leaving a trail of skeletons with hybrid morphology and genomes evidencing multiple interbreeding events – long before the ancestors of modern Eurasians reached the continent. Then the worst happened, 73,600 years ago the sky fell, a nuclear winter set in and rudely shunted the Eurasian population straight towards extinction. In the centuries that followed the Lake Toba event, Denisovans were eradicated everywhere outside of New Guinea, and Neanderthals in Asia vanished entirely. A few small groups of Neanderthals survived in western Europe and the Middle East. The modern humans living in Eurasia were wiped out almost to the last person, we now know that a small group made their way to New Guinea where 2% of the local inhabitant’s genome has been attributed to these most ancient people. Far to the west of Eurasia another small group of humans outran the end of their people by desperately crossing the short expanse of water known now as the Bab-el-Mandab Straights. These, almost certainly Proto-Australoid, refugees brought with them something not previously seen in Africa, the haplogroup L3 lineage. It is well accepted that HgL3 appeared suddenly in East Africa around the area of the Bab-el-Mandab Straights, one of the two easy access routes into, and out of, the continent. 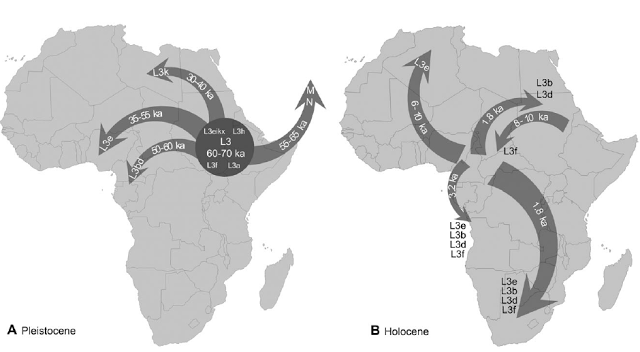 Mapping of the expansion of HgL3 in Africa shows us that this haplogroup was gradually carried from East Africa into Central Africa – a westward expansion as would be expected with an incoming migration. These incoming people would have inevitably merged with the other modern human population living safely in Subequatorial Africa, beyond the effects of the Lake Toba eruption. The descendants of these two ancient populations are modern Sub-Saharan Africans, the KhoiSan and Pygmy peoples. Several millennia after the Lake Toba eruption, the climate began to recover, and some small number of survivors (estimated at around 200 individuals) moved north from their subequatorial safe zone. These intrepid explorers boarded their canoes and rafts and made their way from the tropical coastlines of Northern Australia up through Indonesia to mainland Southeast Asia. So, began the recolonisation of Eurasia around 60,000 years ago. It is time for scientists to start talking about the Out of Australasia and Into Africa theory of human origins. Bruce Fenton is an ancient mysteries and human origins researcher currently based in Australia. He is the author of the book The Forgotten Exodus – The Into Africa Theory of Human Evolution.